mask enhance your anti-aging regimen. includes a thorough, melticulous comedone extraction. soothing, and a skin-energizing, youth-promoting, antioxidant boost. A plus: properly cleansed, softer skin helps promote a smoother less irritating shave at home. treatment even for stressed, very parched skin. Dry skin has met its muse. and purges pores of acne-causing nasties. Anti-Aging Intensive Collagen & Elastin Infusion on the face and neck. Helps renew skin's softness, strength and elasticity. Our most up-lift-ing facial. While not required, this treatment is ideal at day's end for more trans-epidermal absorption time. calming & cooling. With reparative antioxidants and non-steroidal anti-inflammatories. A "trooh" skin-saver. A soothing Superskin Facial with the careful removal of stress blemishes (one tends to get them when frazzled). A relaxing hand & foot scrub then limb-by-limb massage deliver you to a state of blissful skinvana. Skin Picker-Upper Clarifying + hydrating: perks up tired-looking skin. All “Dew” Respect Dry skin gets its "dew": softening + moisturizing. Diamond Microdermabrasion Facial Talk about polish! 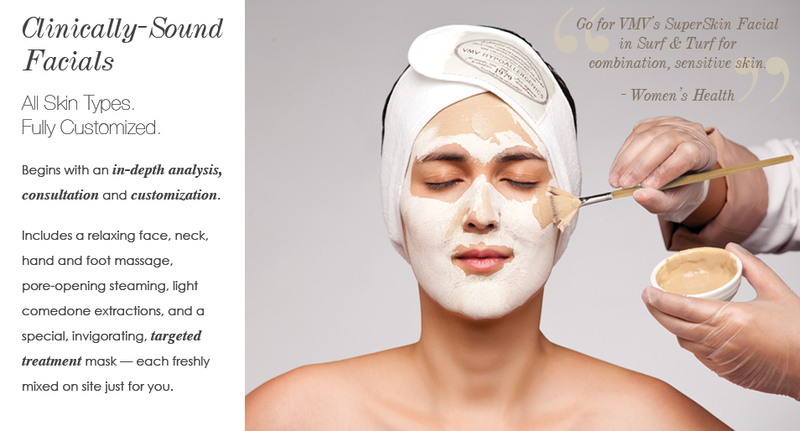 Our perennial client-favorite SuperSkin Facial (customized to your skin type) with Microdermabrasion. This popular procedure uses natural diamond chips to gently polish and stimulate skin while vacuuming away dirt, porecloggers, and other debris. POWER COUPLES Peels and Microdermabrasion can be customized further to specific areas or combined with other procedures for multiple benefits. SuperSkin Power Peel Our classic SuperSkin Facial with a Re-Everything Glycolic Acid Peel plus Diamond Microdermabrasion. and our Anti-Aging Intensive Collagen & Elastin Infusion. Copyright © 2015 VMV Hypoallergenics. All rights reserved.